The reverse design features a Phrygian Cap with Rays which has long been symbolic of liberty free thinking on coinage. 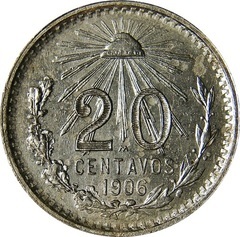 Below the design is a ¾ wreath with denomination “20 CENTAVOS” and date of issue above. 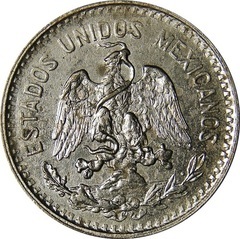 In between the denomination is the mint mark “M” for the Mexico City Mint. 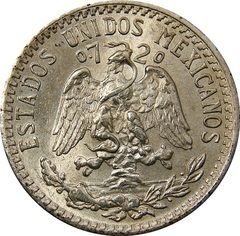 Starting in 1920, the new type 2 coins were slightly modified from 1919 by reducing its silver content from .0932 to .0772 ounces of silver. Excluding errors and varieties, the key to the series is the 1908 issue and the semi-key is the 1912 issue.